What’s on my Vanity? 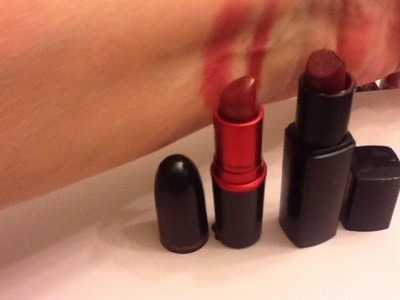 Lipsticks! What’s on my vanity? Is really whats in my basket. 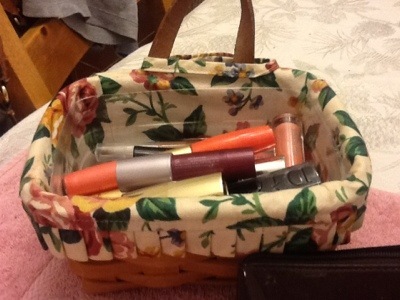 Yes, it’s a nice Longaberger basket, remember when everyone was buying Longaberger baskets? Do they still? I haven’t heard of a Longaberger basket party for so many years, but I do love their baskets and have way more than anyone person should own. Not that I obsess much. For the past 6 weeks I’ve had lipstick 💄in my vanity/basket. For those of you new to my blog and you tube channel I keep items in a basket, on top of my vanity I’m somewhat overwhelmed with, as in I have too many, and I need to work through them to see which ones I like, which ones work for me and which ones I need to find a new home for. 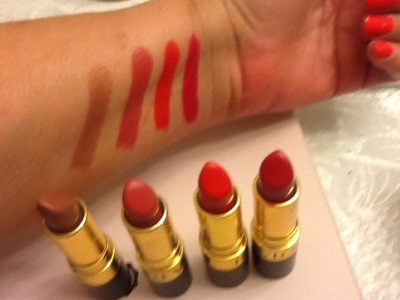 These are my favorite lipsticks from my collection of Revlon. They are Mink, Teak Rose, Fire & Ice and Cherries in the Snow, going left to right. As you may or may not know CITS and F&I were released in 1953 along with nail polish to match your lips to tips. I love this trend and so happy it is coming back. I wrote about this back in November, which at that time Revlon was the only brand you could find matching lips to tips. Look just a few short months later and Butter London released the Lippy, soon to be followed by Mac and I’ve heard Estée Lauder is jumping on that band wagon. My all time favorite combination of lips to tips will always be CITS. 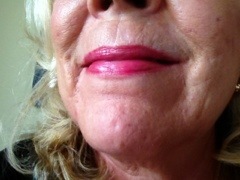 This Mac Viva glam IV and Vincent Longo Eve Rose. Both such great lipsticks. I did a review of the Vincent Longo lipstick here. 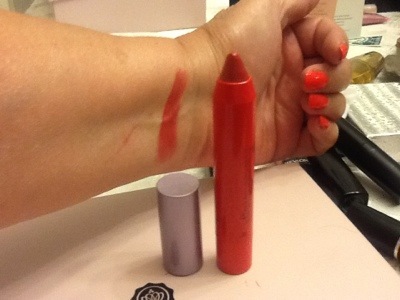 I promise I will do a post about the Mac viva Glam project. Every cent of the purchase price of your Viva Glam lipstick you buy goes to the Mac Aids foundation. They are doing such great things for those afflicted with aids and for the families of thos afflicted with this terrible disease. I like it that ONE HUNDRED PERCENT OF THE PURCHASE PRICE GOES TO THE FOU DATION. I feel very strong about this and I promise when I have more facts I will post more about it. 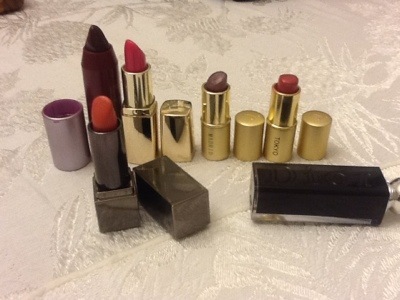 Now, would you like to see my mini collection of lipsticks? Yea?
. 💄This Tarte lip surgence in fever was a total surprise to me, I’m surprised at how much I like it. I have always been a girl to shy away from orange lipstick, orange nails, you get the picture. But this color works for me and I love it. I wear it quite often.
. 💄I wanted to show you these lip surgence screw up from the bottom and there is actually a lot of product there. I’m showing this because one of my girls thought the only product was what was shown when the cap comes off. Now you know. Also, my little mini one does the same and it screws up about another inch, not bad for a mini..
Today is Tuesday. 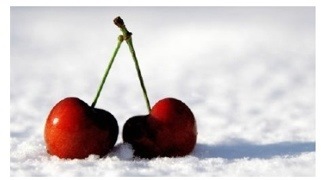 I’ve had Cherries in the Snow (CITS) on since Sunday morning. Today I noticed chipping and wear. As you can see, especially in the bottom picture, I have chips on pointer finger and wear on all the others. Ashley helped me with pictures and it is worse than I could see. I’d seen the chip on my thumb but I had not noticed the chipping on the pointer finger. I don’t look at my fingers from that angle! I’m sorry to see the chipping so soon, I was actually liking this polish. And, if I was in a normal time I would just paint a quick coat on to patch things up. 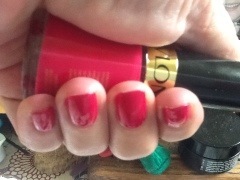 But, because I am doing a comparison run on this polish I am taking it off. 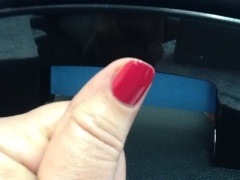 For all the polishes in my comparison I will remove at the first sign of chipping. All polish will be applied over 2 coats of Nail Envy by OPI with a base coat from Julep. Each one will be topped with a topcoat by Seche Vite. So what’s next on my comparison list? OPI Wooden Shoes Like to Know. This quickly became one of my favorite polishes of all time when it was released earlier this year. The weather here has turned dark and gloomy so this beautiful brown with flecks of gold will be perfect! In my effort to do a proper review of this polish I did some research into it. 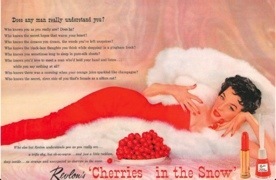 Cherries in the Snow, referred hereafter as CITS, was released in 1953 by Revlon. I found a copy of the original ad that ran for this color. How cool is that? I love it! I wanted to know when this was released because I thought I had this lipstick back in the 70’s. But I thought I must have been mistaken, but sure enough it has been around long enough that this probably is the red lipstick I used then. I’ve always known I needed blue based reds, so it makes perfect sense. 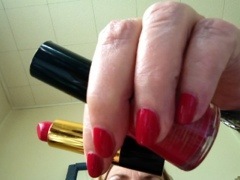 Fire and Ice is another color from Revlon that has been around since the 50’s. It too is a blue based red, is a cool red, but it is more on the orange side. After 2 full days of wearing this polish there is not a chip in sight. 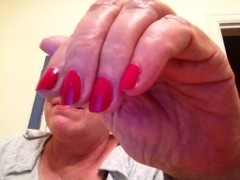 I did start with 2 good coats of Nail Envy by OPI the night before and I used a base coat prior to applying. 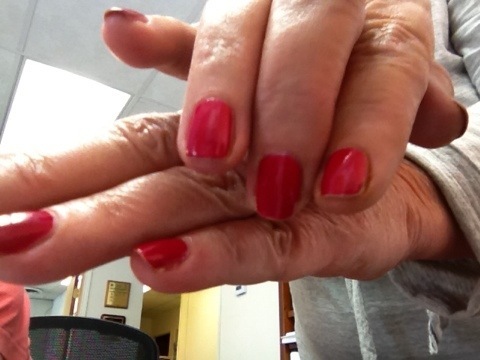 I applied 2 coats of the CITS, a topcoat of Seche Vite. This is #5 in my Sunday series. For those of you that are new, first of all Welcome!, and B) every Sunday I wear a polish, in my collection, that I have never worn. For whatever reason. I have several polishes that I had to have, some of them I ordered on-line to get, and then never wore. This is going to rectify that situation. Hopefully. 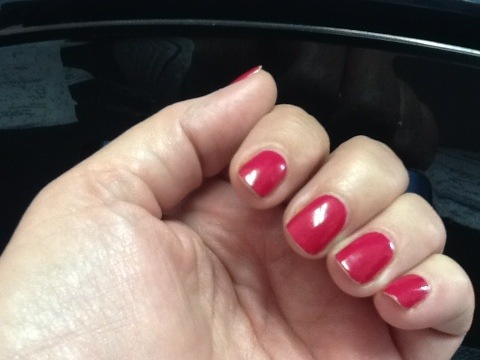 Also, the other part of the challenge is to wear the polish until Wednesday. So far, I am 2 for 2. Only 2 polishes have made it until Wednesday (Tuesday night). 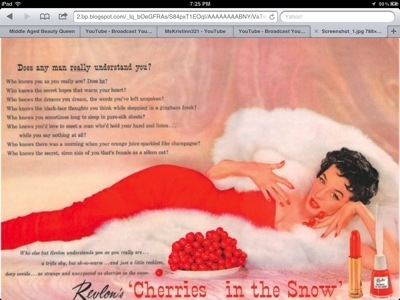 This is Cherries in the Snow by Revlon. The color is gorgeous. It also has the lipstick to match. Such a classic look. This is a true cherry red, with blue undertones. Perfect for my skin tone. I’ve owned the lipstick for many years. 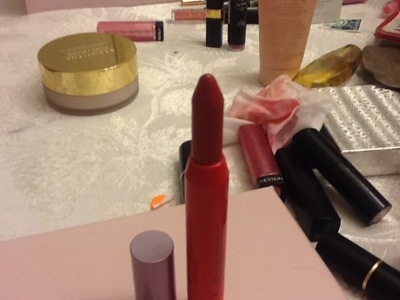 It has been my go to red, you know every girl needs a good red lipstick. As a new part of the Sunday Series, I am going to do a proper review of the polish.. I have been asked by several people if I would do a comparison of the different brands. And to be honest, I’ve never felt like I was the right person to do that because I change my polish so often. Only out of boredom! But I will do a test run with this polish, and all future polishes featured on Sunday Series. I hope you guys will like that. I will keep the blog updated about the results. It should take a good month to have a good comparison ready. 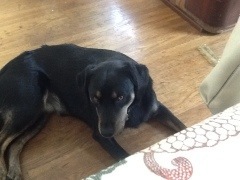 Betty is always close by! Love her!